Several mathematical areas were started by Ron's work, such as worst case analysis in scheduling theory, on-line algorithms and amortized analysis in the Graham's scan in Computational Geometry, and of course, his favorite topics on Ramsey Theory, and the work on quasi-randomness. 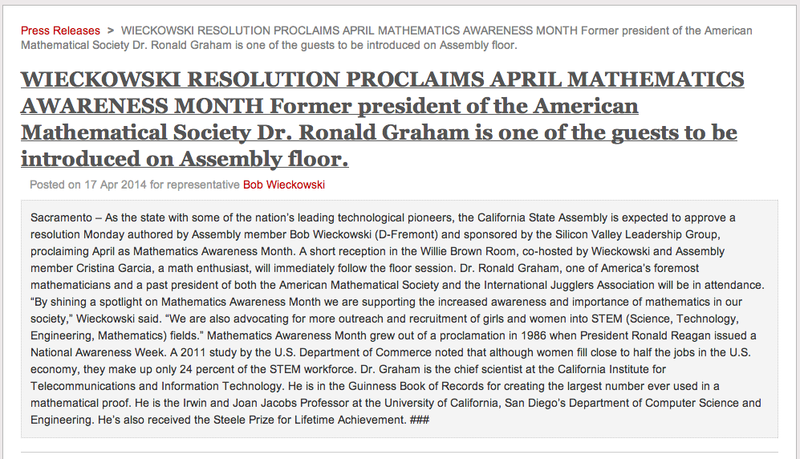 Ron's mathematics was highlighted in the nomination article written by Gian-Carlo Rota for the first contested election of AMS President. (He won ). He received the Steele Prize for Lifetime Achievement in 2003. The book "Magical Mathematics", coauthored with Persi Diaconis, was published October 2011 and here are reviews in NY Times and WSJ. Ron is much adored by his many students at UC San Diego. He was voted to receive the Best Teacher award in 2015. 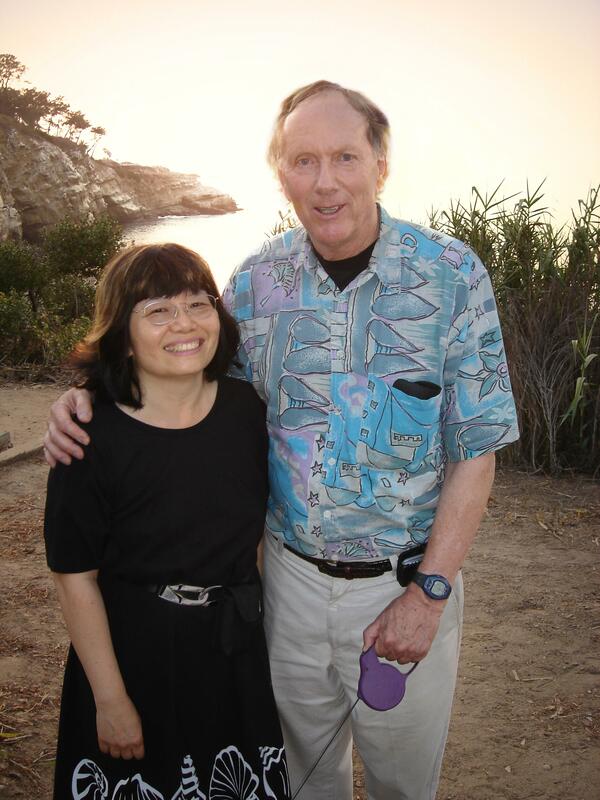 Chief Scientist at California Institute for Telecommunication and Information Technology, Cal-IT2, of UC San Diego. Irwin and Joan Jacobs Professor at Department of Computer Science and Engineering of UCSD. "Here is a picture that Ron and Tom talked about putting routers all over the globe---way before Akamai was built." said David Johnson at Ron's party. Ron was involved in creating Mill's mess and numerous new juggling tricks for site swaps (see "Drops and descents" with Joe Buhler and several other math papers). 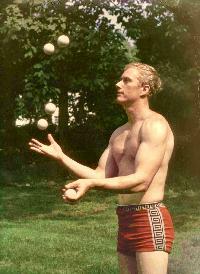 Ron has many juggling students including Steve Mills. There is a 20-minute video of Ron teaching the connection between juggling and mathematics to junior high school students. Also, there is a link to a video on "The secret to juggling". Here is another video on teaching juggling in a segment of Live from Bell Labs. "When Ron first went to Bell Labs, some friends said that it could be the end of his research. Well, he made this place the center of focus in research. He held a series of titles, some were first or one of a kind, 'Adjunct Director', 'Assistant Vice President', to 'Chief Scientist' 'Emeritus Chief Scientist'. He had a ball at the labs. Indeed, there was a great party when he finally left there in 1999." "The highest number ever used in a mathematical proof is a bounding value published in 1977 and known as Graham's number." The biggest number in the universe. Here is a nice video about Graham's number by Catalyst and also in Wait But Why.. More. "This is perhaps the most complicated set of recurrences that will ever be solved", said D. E. Knuth. In college days, Ron was part of a circus act, called the Bouncing Bears. He was on stage with Cirque du Soleil and in an issue of Discover magazine about the Science of the Circus. 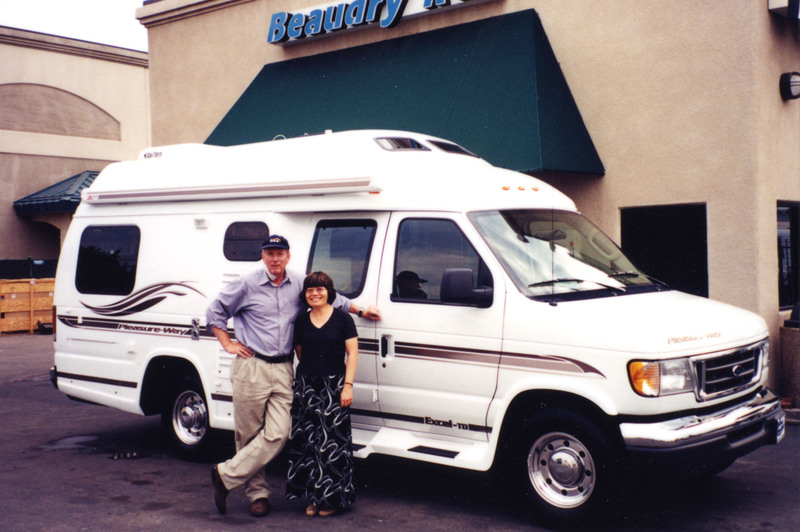 He was a qualified judge for international trampoline competitions and has a unique bungee trampoline for daily exercise. With perfect tones, Ron gave an eloquent speech in Chinese to President Jiang of PRC. Ron Graham at Bell Labs, 5+ minutes,(young Ron with a dimple or two). The Math and Magic of Ron Graham in Something New Everyday. Ron Graham's "Magical Mathematics" Card Trick. What is Graham's Number?, 7 minutes. How Big is Graham's Number? ", with extra. Imaginary Erdos Number, Ron talked about Erdos Numbers. Many picturesque quotes illustrated in fascinating cartoons by John de Pillis. Ron and Erdös, and their many stories and more. Big Thinker Lecture, Computer and Mathematics, The Shortest Network problem . Various articles, "Renaissance Man" (Star Ledger), 20 Ideas in Research, ( Discover), Wired, Too big to write but not too big for Graham. Publication list (recently completed thanks to Steve), patents, profiles. More information: vita (outdated), ancestry, news, math awareness press, quotes, old photos. 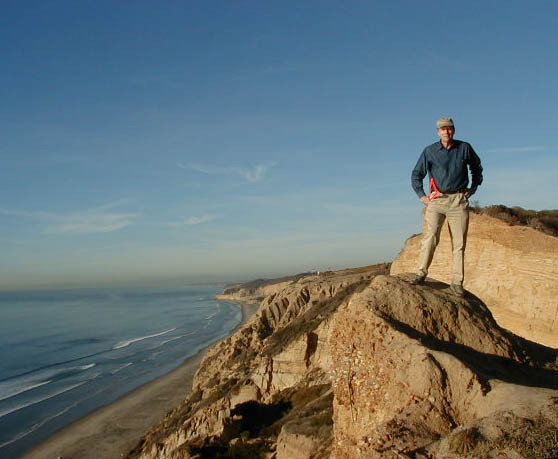 Ron's WIKI page|Ron's birthday celebration at Simon Fraser University June 15-19 2015 and a great gathering of old friends Jan 30-31, 2016 at UCSD. Star in the short film "Chasing the world's largest number", trailer, 12 segments, 22 minutes in total. This page (still under construction) is being prepared by the obvious suspect for the fun and love that they have been sharing in life and in mathematics.